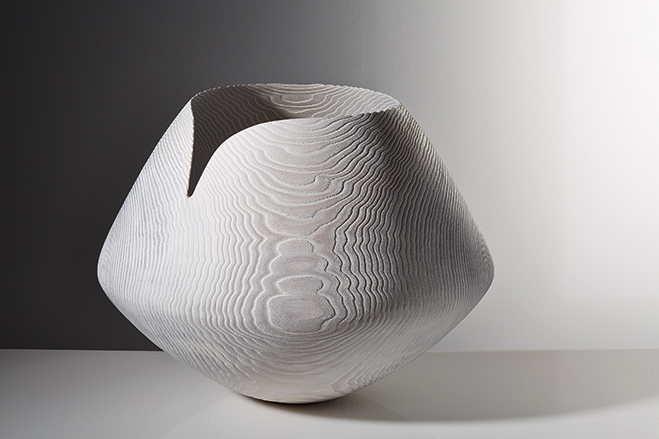 Vase shaped vessel, bleached ash, brushed and sandblasted. Photo by Richard Becker. Woodturning is probably one of the subjects that I have the least experience with, well in terms of practical application. Which is probably why I’m so attracted to the craft in general, using it as a source of exploration and inspiration. 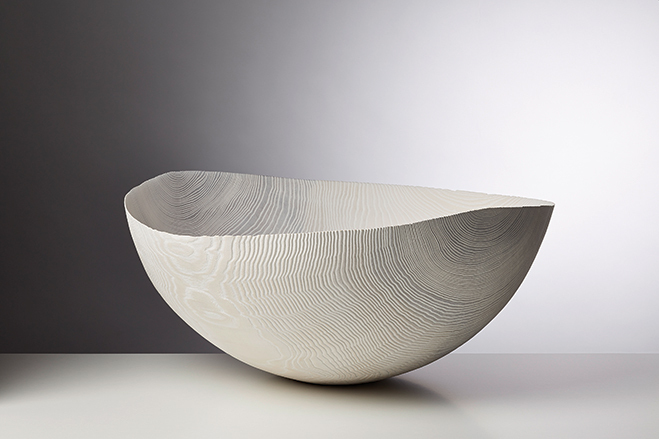 Today we’re examining the work of Friedemann Bühler, who crafts sculptural vessels and bowls out of wood. Born in 1966, Friedemann Bühler has been working with wood since 1996. He approaches the creation of these vessels much like any craftsman would, first he selects the wood, preferring to source the wood himself from the forests of Hohenlohe, a small region in the northern part of Baden-Württemberg. The wood that he picks for his projects all have to have some character and start the vision for what the vessel is about to become. After selecting the wood he uses custom chisels and gauges to turn the blank on a lathe, some pieces taking years to complete as they go through the various finishing processes. 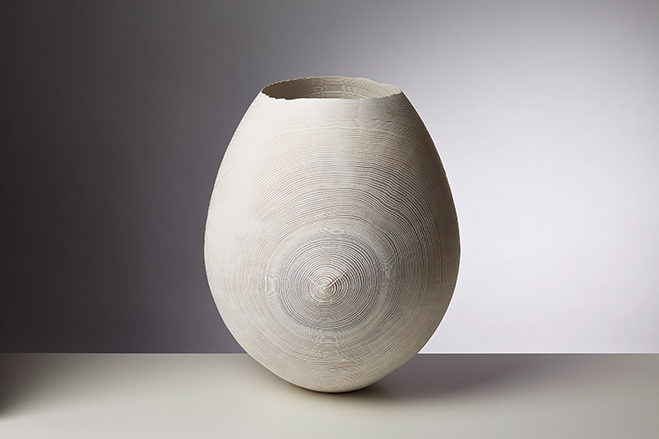 An attractive element of his work is the simple form and subtle use of colour, it’s no surprise then that he’s inspired by contemporary ceramics. You would think that these are made of ceramics at first glance, which is the same for many of the wooden vessels in our shop, particularly the Japanese lacquerware. Anyway, here’s a lovely selection by Friedemann Bühler, I hope you’ll take your time to consider these handcrafted artworks and admire their true form. 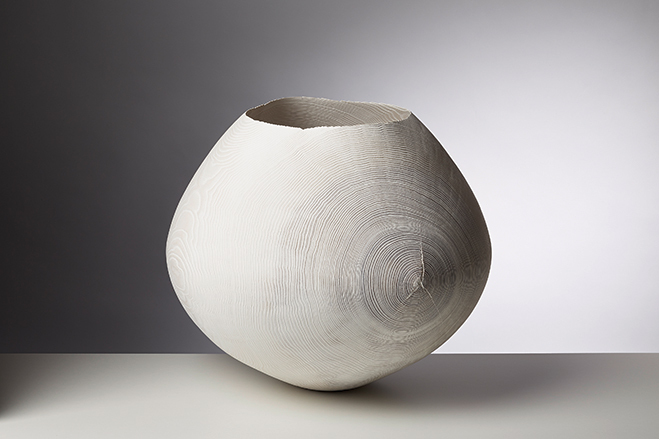 Tall vessel, bleached ash, brushed surface. Photo by Richard Becker. 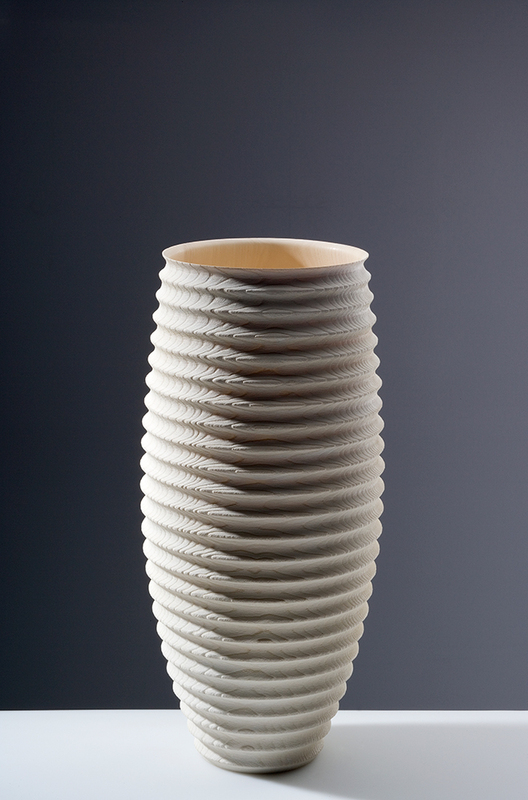 Tall vase shaped vessel, bleached ash, brushed surface. Photo by Richard Becker. 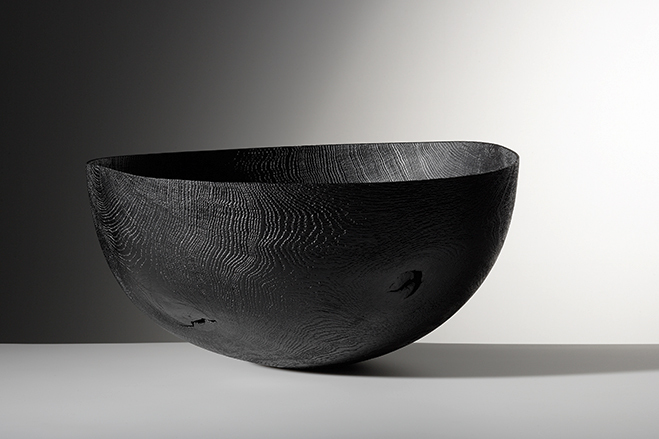 Bowl, blackened oak, brushed, sandblasted. Photo by Richard Becker. Cut-in bowl, bleached ash, brushed and sandblasted. Photo by Richard Becker. 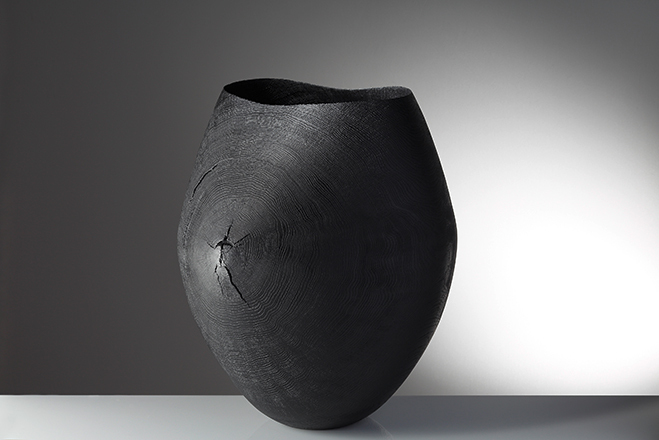 Tall jagged edged vessel, blackened oak, brushed, sandblasted. Photo by Richard Becker. Open bowl, bleached ash, brushed and sandblasted. Photo by Richard Becker. 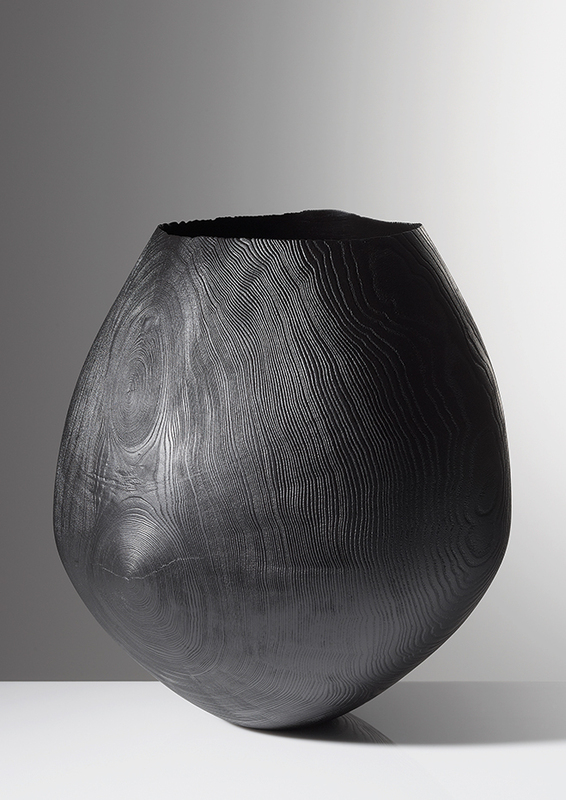 Tall vessel, blackened oak, brushed, sandblasted. Photo by Richard Becker. 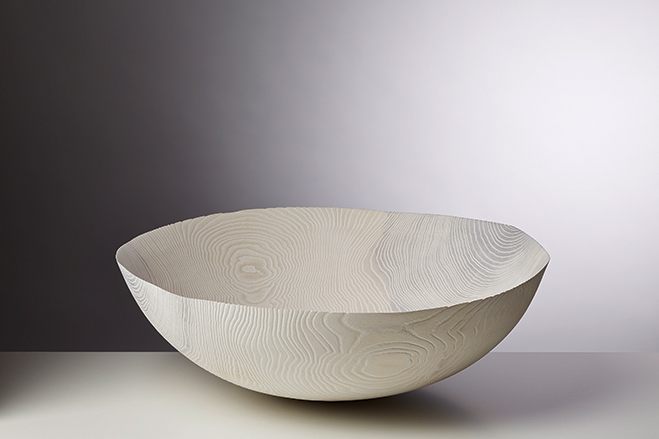 Wide bowl, bleached ash, brushed and sandblasted. Photo by Richard Becker.